Grocery stores everywhere are pushing pumpkins right now. And even if you aren’t the jack-o-lantern type, don’t let the opportunity for fresh DIY pumpkin seeds (or seeds from any kind of squash) pass you by. Most store-bought pumpkin seeds are over-roasted and rancid, destroying most of the healthy nutrients that make them such an ideal snack to begin with. Pumpkin seeds provide us with a wide array of health-boosting antioxidants, and offers many unique benefits. Unlike other foods, these seeds offer a full spectrum of different vitamin E forms, some common and some rare and just discovered. This makes it easier for the body to absorb this important family of antioxidant compounds from pumpkin seeds than from other sources. They are also a rich source of several other antioxidant phytonutrients, offering immune boosting, disease fighting and anti-aging properties. Pumpkin seeds are a good source of complete protein that contain all 9 essential amino acids, including concentrated amounts of mood-balancing tryptophan. They are also a minefield of vital minerals and nutrients, like magnesium, iron, copper, selenium, calcium, phosphorus, manganese, zinc, and fiber. The World Health Organization highlighted pumpkin seeds as an especially good daily source of zinc, which is vital for strong immunity, wound healing, growth, brain health and eye health. Other health benefits of pumpkin seeds include protection from diabetes, microbial infections, post-menopausal issues, cancer and prostate problems. 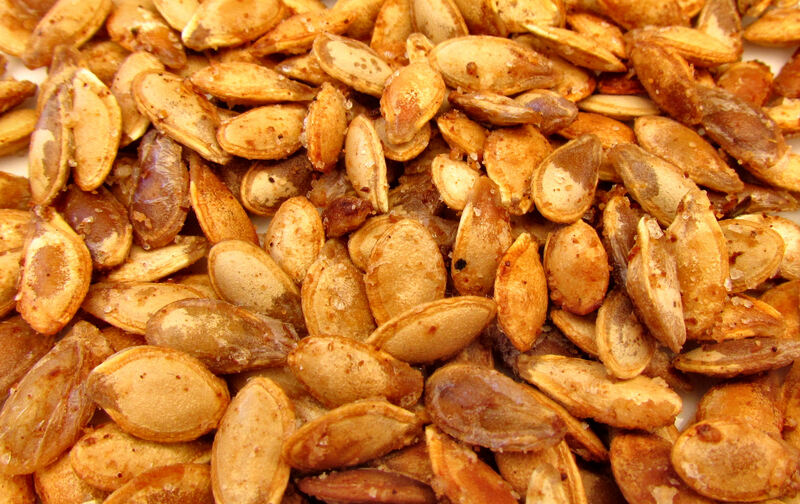 Like other raw nuts and seeds, pumpkin seeds are a great source of plant-based omega-3 fatty acids. But while many people are highly allergic to nuts, pumpkin seed allergies are much less common, making them an excellent substitute — especially when you need a dash of nutty flavor or texture in a healthy salad, a stir-fry, a dessert, a smoothie, in a bowl of oatmeal, to make a nut butter or – just like this, eaten roasted with a dash of seasoning for a perfectly satisfying, health-boosting, crunchy nosh. Scoop out the seeds from the inside of a pumpkin. Wipe off any extra pumpkin pulp that may be sticking to the seeds with a paper towel. Spread the seeds out on a sheet of parchment paper, and allow them to air dry overnight. If you want to season your pumpkin seeds, than place them in a bowl and toss them with about 2 tablespoons of olive oil, melted butter or melted coconut oil. Then sprinkle in your seasonings of choice (options: sea salt, cayenne pepper, Cajun spices, garlic powder, cinnamon, pumpkin spice, etc.) and toss them to coat. Spread the seeds out in a single layer on a baking sheet. Roast in an oven set to 200 degrees Fahrenheit, stirring periodically, until lightly golden brown.